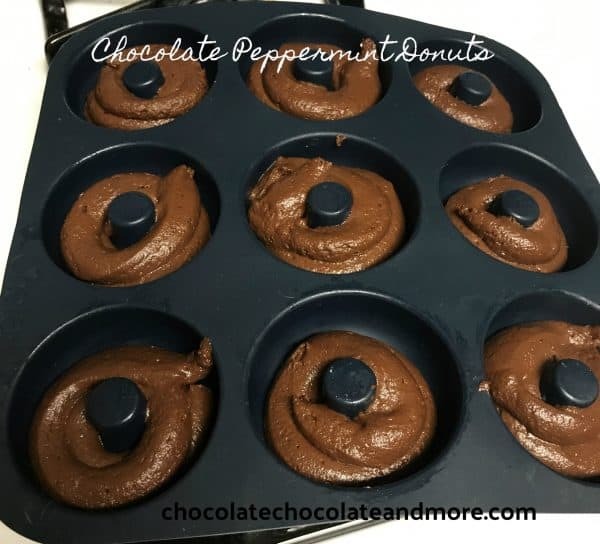 Chocolate Peppermint Donuts - Chocolate Chocolate and More! Chocolate peppermint donuts are a festive start to the day. Enjoy them with your coffee for breakfast or with a cup of hot cocoa later in the day. Silicone pans and tools from Chefast make these donuts a snap and you can win your own set! One of the reasons I love this time of year is because I love everything peppermint and chocolate – my morning coffee, cookies, cakes, creamers, donuts. It is the only time of year I can pretty much guarantee my breath always smells amazing! I have never owned a donut pan. To be honest, if I have want a donut, I have several options to just go buy one within a few minutes walk or drive of my house. But there is nothing better than a warm donut and how often are the donuts warm at the donut shop? 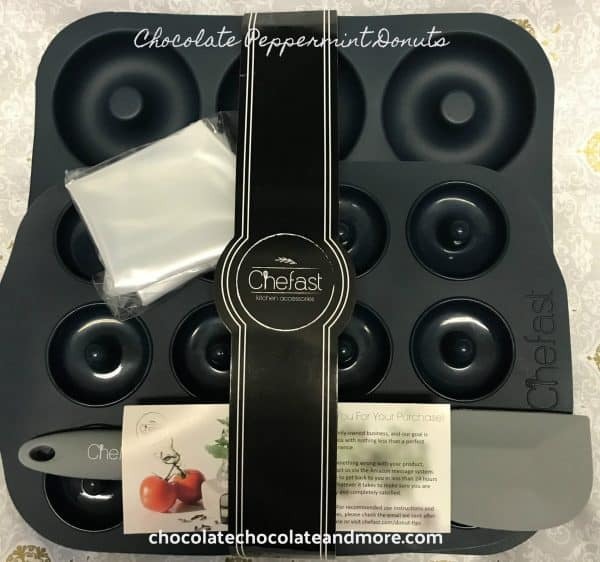 Chefast recently contacted me to see if I wanted to give their Chefast Non-Stick Donut Pan a try. The answer was obvious — OF COURSE! The Chefast Donut Pan Combo Kit includes a large donut pan, mini donut pan, silicone spatula, five pastry bags, and even recommended baking tips and recipes! And the best part? The pans are silicone and not metal, which makes getting the finished donuts out of the molds that much easier! All I had to do was push up on the bottom of each donut and out they popped, easy peasy. These chocolate peppermint donuts are adapted from Joan’s Chocolate Cake Donuts. The batter is very thick. This ensures your donuts rise neatly and don’t spill over the sides of the cups. Now here’s a time saver tip. Don’t spoon your batter into the donut pan. Instead, line a large cup with the Chefast pastry bag and bend the tip upward at the bottom so the batter doesn’t ooze out. Fill the bag with batter and then use it to fill your donut pan. If you don’t have a pastry bag, you can use a gallon-sized ziplock bag. Pour your batter into the bag then seal. Push batter away from the corner you’ll be using as a pour spout. Cut a small piece of that corner off, making a hole about 1/2 inch wide. Filling the pan does take 2 hands (one to hold the main body of the bag and the other will manage the “tip”) but less mess is always a good thing in my book. You only need to fill each mold about half way. If you fill it to the top, the donuts will be a bit lopsided. One batch of batter makes nine large donuts and three or four small ones. 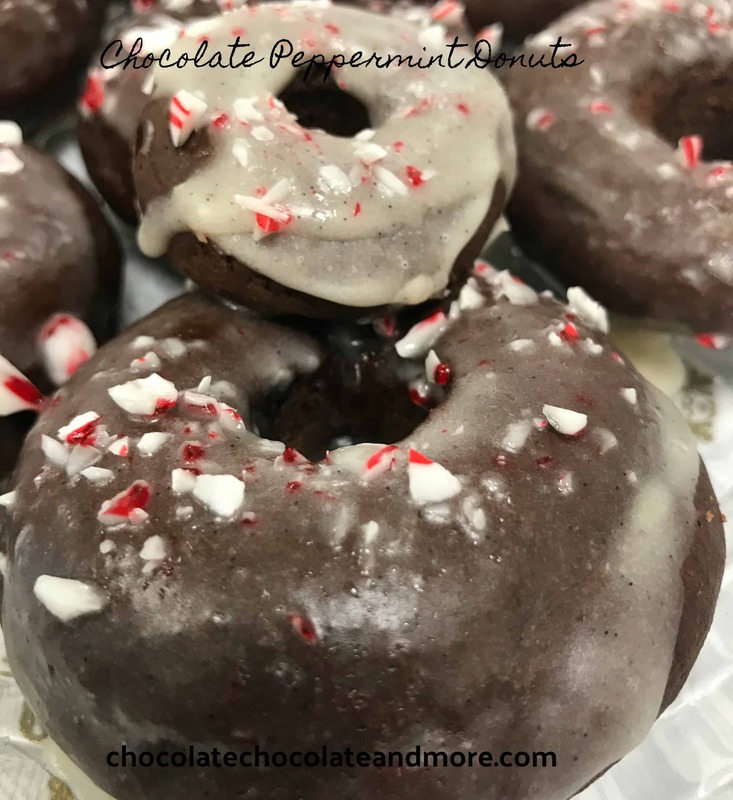 Chocolate peppermint donuts have peppermint in the donut and the glaze so you have that wonderful chocolate-peppermint flavor throughout. One warning when using peppermint extract — a little bit goes a very long way. The recipe really is correct when it says only 2 drops of peppermint extract in the glaze. The final touch is some crumbled candy cane. I just took two mini candy canes and crushed them up in a ziplock bag. Sprinkle them on top and voila! I can’t wait to give my Chefast donut pans another try. I think I might tackle Apple Cider Donuts next! You can see all that Chefast has to offer by visiting their Chefast Product Line on Amazon.com. And they have a special 15% off promo code for you to use — just type in UCHEF15X at check-out! In a large bowl, whisk together sugar and egg. Add oil, sour cream, vanilla and peppermint, whisk until combined. Alternating, add flour mixture and milk, stirring until no lumps remain. Lightly grease donut pan. Spoon batter (or use a pastry or plastic bag as described) to fill donut indentation to 3/4 full. Bake for 8-10 minutes. Test for doneness using a toothpick. Do not over bake. Remove donuts from pan and let cool completely before icing. Sift powdered sugar to remove any lumps. Stir vanilla. 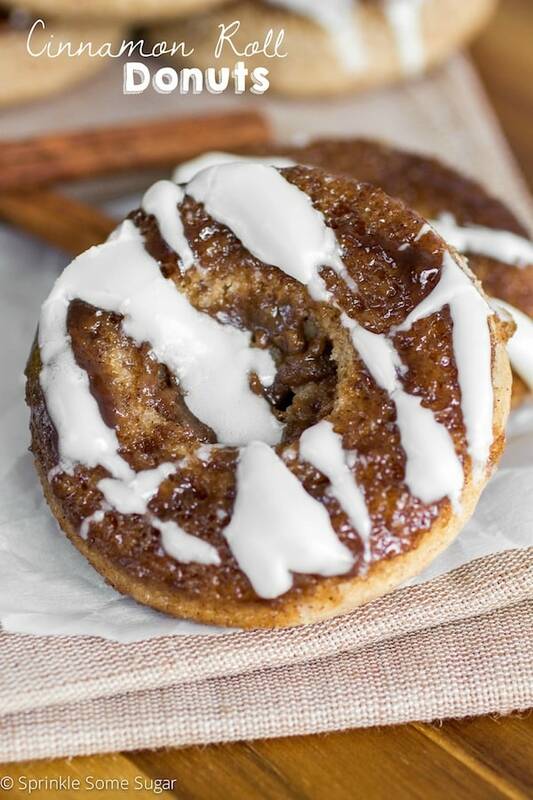 drops of peppermint, and milk into powdered sugar, adding enough milk to create a thick glaze. Dip tops of donuts in glaze to coat or spoon glaze over donuts. Let glaze set before storing in an airtight container for up to 3 days. If you would like a chance to win the same set I used to make these donuts, here is your chance! This contest is open to U.S. residents only and will end on December 22 so we can hopefully ship it before Christmas (not sure you’ll get it that fast but we’ll try). 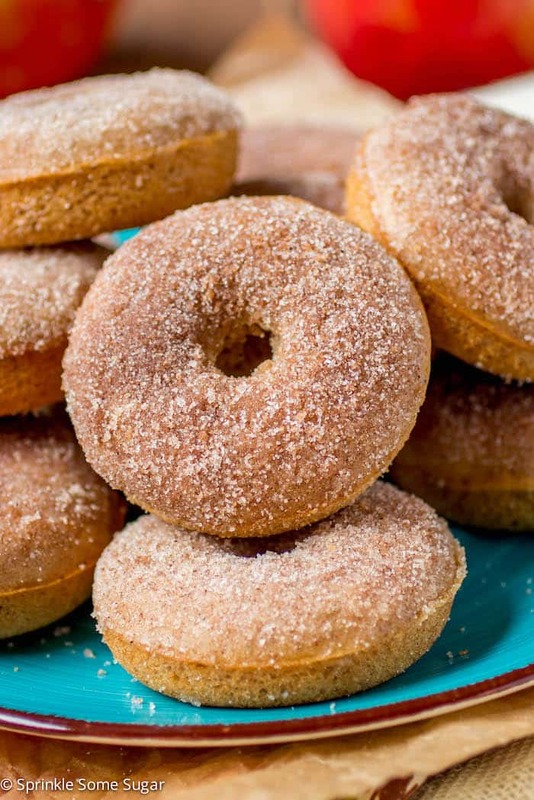 Try these other wonderful donut recipes!